Glacier Steel Roofing Products Inc. Founded in 2012, Patriot Roofing is an expert roofing company providing exterior home improvement services to Gig Harbor and the nearby areas in Washington. We offer roof repair, roof replacement, siding installation, and skylight installation to help you get the performance and curb appeal you want from your home's exterior. If you have issues with damaged roofing or siding, have materials that are past warranty, or simply want to upgrade your home's appearance, we're here to help. Give us a call today to get a free estimate on any of our roofing or siding services in Gig Harbor, Tacoma, Kitsap Peninsula and throughout the surrounding areas! Custom fitted by Manufacturer Certified Installers, Gutter Helmet® installs right over your home's existing, full-sized rain gutters. 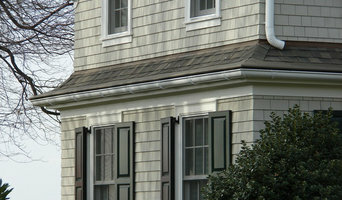 With Gutter Helmet® you avoid costly damage caused by clogged gutters, ice dams, and other common rain gutter problems. Gutter Helmet® is backed by a Manufacturer Triple Lifetime Performance Warranty that is also transferable. Manufactured using 99% recycled aluminum, Gutter Helmet® is not only a green product, but it is the only gutter guard company that can state it has officially installed over 65 million feet in the U.S., more than six times any competitor. Family owned and operated since 1981, the Gutter Helmet by Harry Helmet® Team has helped over 100,000 homeowners improve the value of their homes with the installation of Gutter Helmet® and other high quality exterior home improvement products including seamless gutters and Helmet Heat®. Protect yourself and your home today by contacting us for a FREE in-home estimate (888) 543-5638 or visit us online www.HarryHelmet.com. Latah County's Expert Roofing & Gutter Professional 4x Best of Houzz! Haider Construction Inc, is a licensed, bonded and insured contractor in the State of Washington. Owner and President Ron Haider has over 25 years experience in the roofing and construction business. Our offices are located in Mountlake Terrace, Washington and we serve all areas of King and Snohomish County. Ron Haider and Chris Sawall both handle remodeling bids and project management. Either Ron or Chris will begin by meeting a prospective remodeling client to review and define the particular requirements of a remodeling job. After the initial meeting,a project bid will be presented that outlays a timeline and expenses. Further meetings are usually needed to fine tune the project’s scope, explain product options, job site considerations and to finalize the budget. Your remodeling project usually begins within weeks of our receiving the signed contract. Some roofing companies subcontract out their labor but Haider Construction’s roofing crews are our employees. We are proud to mention that the same crews have worked for us for many years and bring their own pride in workmanship to your job. A directly employed crew guarantees a far more reliable service to our customers. All of our employees are required to undergo safety training , and through the Certainteed Select Shingle Roofing program have received additional training and passed examinations that qualify them for this certification. They share in our expectations for excellent customer service. Our goal is to provide homeowners with quality products and master craftsman installation. Our prices are always affordable and customer service is always our top priority. We understand that it can be tough finding a contractor you can trust, and that is why we do things the way we do. With our estimates, there are NO HIDDEN FEES and no surprises at the end of the job. The price that you are quoted is the price that you pay. When we come out to your home we explain your project to you from start to finish. We will answer all of your questions and give you an estimate down to the penny. No games, no pressure, just good business. With this challenging economy we understand that times can be tough, and people are sometimes sacrificing quality for price. We offer a solution with factory direct pricing on several products and easy, flexible financing options (O.A.C.). Once you make the decision to improve your home with us, we will work diligently to complete your project in the agreed upon timeframe. We will treat your home and neighborhood as if they were our own. We custom design rain systems that cannot ever CLOG and allow water damage to your roof, fascia, soffits or foundation. our goal is to balance aesthetics with function to ensure your rain gutters properly handle the water coming at them for good. 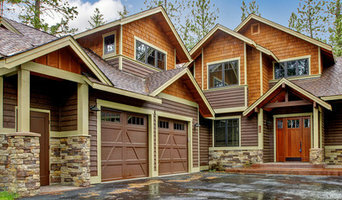 Hanley Construction is the premier roofing company on the Kitsap Peninsula. We are a full service roofing company company that handles all types roofing for commercial and residential projects. We provide year around roofing services. We handle complete roof installations, provide repair and maintenance services as well as ventilation and insulation systems. When it comes to roofing Hanley Construction is the gold standard. 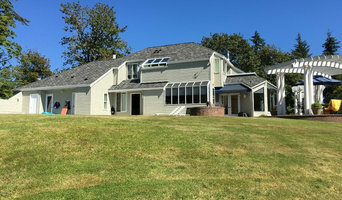 Guardian Roofing is a locally owned, full-service roofing contractor that specializes in unique roofing solutions for homeowners in the South Puget Sound. We offer expert installation, maintenance and repair services by a team of highly skilled, factory-trained professionals. Our philosophy is to thoroughly inspect our clients homes; following inspection we spend as much time as necessary educating each homeowner of our findings. Based on our findings, and homeowner feed back we use our extensive product knowledge to design a system that meets our client's needs. Our team serves thousands of customers across the Puget Sound region and is passionate about helping homeowners make their roof last for life. When customers choose us, their experienced, trained contractor team spends as much time as needed to understand the condition of the home, and the corrections necessary. This often means utilizing maintenance and repairs whenever possible – rather than focusing solely on the purchase of a new roof when it may not be needed. This commitment to honesty and integrity has helped the company grow and thrive, while gaining loyal customers across the Puget Sound Region. We are standing by ready to help you with all your roof maintenance, repair, replacement and pest control needs. Let us know how we can assist you! Call our office today at 877.926.9966. Cornerstone Roofing, Inc. has been servicing King and Snohomish Counties since 1996. We employ all of our knowledgeable roofing crews and our leadership team has extensive experience in all aspects of the roofing industry. We are dedicated to providing our clients with a dependable roof system through high quality workmanship, superior materials, and a premium level of customer service. We are a company large enough to handle any of your residential roofing needs, yet small enough to monitor your project from start to finish to assure your complete satisfaction. Cornerstone installs the highest quality roofing products, upholds a strong standard of excellence and ethics in the roofing industry, and displays extensive knowledge in each product we offer. For more information, to learn about our No Payments, No Interest for 12 months (on Approval of Credit) Promotional Offer, or to request a Free Estimate, please visit our website at <a rel="nofollow" target="_blank" href="https://cornerstoneroofing.com/">https://cornerstoneroofing.com/</a>, email info@cornerstoneroofing.com, or call our office at (425) 485-0111. We look forward to speaking with you! Other Certifications and Awards include: Angie's List Super Service Award 2018-2011; Honor Roll, "Page of Happiness". Yelp’s “People Love Us on Yelp” Award Recipient. “One of the Seattle area’s top rated roofers” -The Seattle Times. Puget Sound Consumers’ Checkbook “Top Rating for Quality” (featured on KOMO News). Roofing Contractor Magazine’s Top 150 Roofing Contractors in the United States. Best of Northshore: Best Home Improvement Award - Bothell-Kenmore Reporter (see more below under "Awards"). Rock Roofing was opened in September of 1998, with the idea that there was an opportunity for a company with a high level of integrity, customer service and good "Old Fashioned" ethics. A company that provided mutual respect for it's employees as well as for it's associates in the industry. That idea and concept has proven very successful. Rock Roofing has had a consistent performance level in sales volume and customer satisfaction. We continue to enjoy an impeccable reputation with our suppliers and vendors, as well as our fellow roofing contractors. As the owner, I can assure you that these ideas and concepts are part of our day-to-day communications. Myself and the staff maintain a high level of accountability amongst ourselves, which includes customer satisfaction as our ultimate focus. Our marketing efforts attempt to prioritize our commitment, as a company, to a long term relationship with the communities which we and our families live in. I have been in the roofing industry for over 20 years and I rely a great deal on my experience in management and customer service. I often joke with our customers, that a re-roofing project will make you more of an expert in roofing than you ever wanted to become. It is my hope and belief, that an opportunity for Rock Roofing to provide you with advice and an estimate on your roofing project, will be a very comfortable and professional experience for you. I invite you to contact us for any questions or interest you have as you seek a roofing contractor and I am personally available at any time, for any concerns or comments, positive or negative, that I can assist with. Our commitment is to provide our customers and our community with the highest levels of integrity, quality, customer service, old fashioned ethics and professionalism. These concepts are what Rock Roofing means to us. A company that you can count on is what Rock Roofing should mean to you. We look forward to providing that opportunity to you! Did you know: Of all complaints and claims against roofing companies 15% never get resolved or fixed? •How do I know the roofing is installed properly? oInstalled according to Manufacturer’s Recommendations? oWhat about Building Codes? oAre “Industry Standards” good enough? oWill the flashings be installed properly? •What Roofing Material is best for my Home? •Should I be concerned about Manufacturers’ Warranties? Should I get an extended warranty? •What type of contractor insurance and bonding coverage is best for home roofing? •How will I know if the pricing is fair? How do I know if I'm getting what I pay for? •What is the difference from one shingle to another? •Should the installers be Certified? •Should I be concerned about subcontractors? •How are roofers going to protect my gardens and yard? How will our deck be protected? 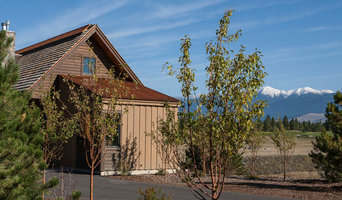 •What roofing materials are best suited for the tough Northwest climate? •Do you want only drug free workers at your home? Will there be smoking on the job? •What payment options are available? •What about the safety of children or pets? •Will the roofers keep the outside of my home clean? •Should I be concerned about roofer safety? What measures are taken to assure their safety? •Should I worry about attic ventilation? 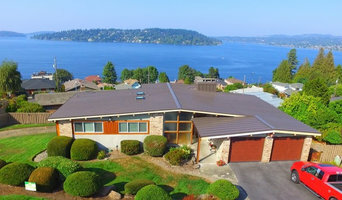 We are a top rated Seattle Roofing Contractor with experience with most roofing materials such as Cedar Shake, Metal, Composition, Flat roofing membranes and more. Our financial options, lifetime warranty, expertise with roofing and installation make us stand out as unique Seattle Roofing contractors. One visit and you’ll be able to tell the difference in expertise and understanding. As a Seattle roofing company for nearly 20 years, we’ve seen it all and we pass this knowledge onto you in order to make sure you get the best roof with the best roofers every time! Sharp Roofing’s experienced roofers bring exceptional product knowledge and professionalism to every job. Your satisfaction is our priority. Our goal is outstanding service and a perfect job the first time. That’s why our motto is “Roofing Done Right™”. Your Licensed & Certified Eco Friendly Roofers in Kirkland & All of King County Pro Roofing NW is a family owned and operated business with unparalleled expertise. From repairing badly damaged roofs to removing cedar and composition roof and installing Lifetime Warranty Composition Shingles on either residential or commercial properties, our professional roofers can handle the job. At Pro Roofing, we know that everything you love is under your roof. Our company and staff take this into consideration and treat every roof as if it were our own. We want our clientele to be secure in the fact that we value satisfied customers. Roofing and gutter contractors in Seattle, WA can install a new roof, repair an old one or extend an existing one, as well as repair and replace gutters. They can inspect roofs and guttering after damage from harsh weather, and also offer services such as roof insulation, and general maintenance such as roof and gutter cleaning. Some specialise in specific types of roofs, such as tile, metal or Colorbond roofing. Here are some related professionals and vendors to complement the work of roofing & gutters: Building Project Managers, Specialty Contractors, Cladding & Exteriors, Doors, Garage Doors. Find a roofing company and gutter professional on Houzz. Narrow your search for professionals by selecting your nearest city or postcode. Look at portfolio and product photos, and read reviews to find the best roofing company and gutter professional for your Seattle, WA home.